The project AtmoHIT, the Atmospheric Heterodyne Interferometer Test, is part of the Rocket Experiment for University Students campaign (REXUS 22), realised under a bilateral Agency Agreement between the German Aerospace Centre (DLR) and the Swedish National Space Board (SNSB). It was selected by the committee to be launched on a REXUS rocket in March 2017. The AtmoHIT experiment The proposed experiment on-board a REXUS rocket consists of the instrumentation of a satellite mission. AtmoHIT has the goal to verify the AtmoCube-1 remote sensing instrument under space conditions by measuring temperatures in the middle atmosphere. 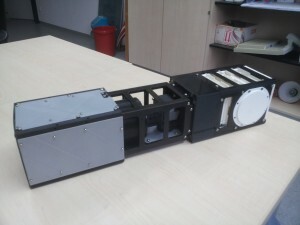 The 3U CubeSat AtmoCube-1 is currently developed within the Development Initiative for Small Satellites Exploring Climate Processes by Tomography (DISSECT), initiated at the University of Wuppertal and the Research Centre Jülich. The AtmoHIT experiment consists of a highly miniaturized and rigid Spatial Heterodyne Spectrometer (SHS), which measures the oxygen atmospheric band emission in the middle atmosphere. The instrument resolves individual rotational lines whose intensities follow a Boltzmann law allowing for the derivation of temperature from the relative structure of these lines. This instrument is characterized by its high throughput at a small form factor, allowing to perform scientific remote sensing measurements within a CubeSat.